W.C.T.U. Feb. 17, '59 February Meeting both president and secretary on Vacation in Arizona - according to Program Guide. Mrs. Eva Peppon was hostess - devotionions by Mrs. Eva Peedy and Mrs. Bessie Parish was leader. 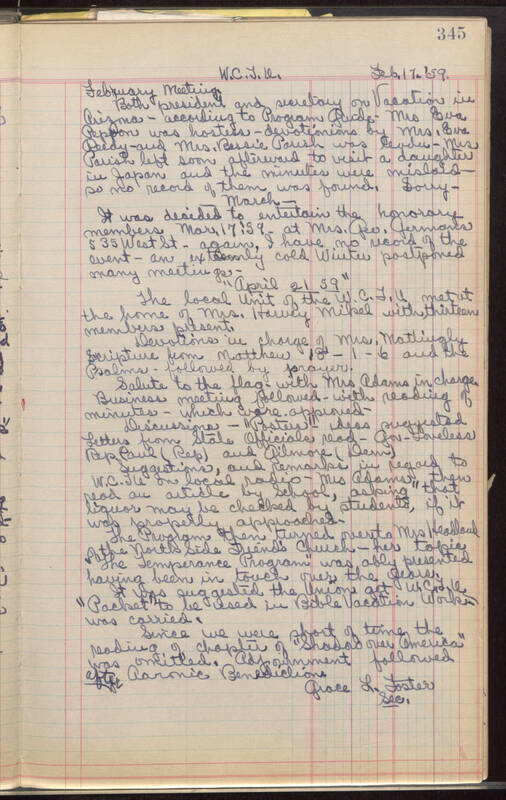 Mrs. Parish left soon afterward to visit a daughter in Japan and the minutes were mislaid so no record of them was found. Sorry. March It was decided to entertain the honorary members Mar. 17, '59 at Mrs. Geo. Germans 535 West St - again, I have no record of the event - an extremely cold Winter postponed many meetings. "April 21 59" The local Unit of the W.C.T.U. met at the home of Mrs. Harvey Mikel with thirteen members present. Devotions in charge of Mrs. Mattingly Scripture from Matthew 18 - 1-6 and the Psalms followed by prayer. Salute to the flag with Mrs. Adams in charge. Business meeting followed with reading of minutes which were approved. Discussions - "Posters" - ideas suggested Letters from State Officials read - Gov Loveless Rep Paul (Rep) and Gilmore (Dem) Suggestions, and remarks in regard to read an article by School, asking "that liquor may be checked by students, if it was properly approached. The Program then turned over to Mrs Headland of the North Side Friend's Church - her topic "The Temperance Program" was ably presented having been in touch over the years. It was suggested the Unions get W.C.T.U. "Packet" to be used in Bible Vacation Works was carried. Since we were short of time the reading of chapter of "Shadow over America" was omitted. Adjournment followed after Aaronic Benediction. Grace L. Foster Sec.